Although this is Day 2 for me and the vast network of IBMers and partners here in Las Vegas, today is the official start of InterConnect 2016 for IBM customers. All the walking involved in making my way around a venue catering for 23,000 delegates has helped me shake the last of the jet-lag as I head into another packed day. Unsurprisingly after the theme of the Business Partner Summit sessions yesterday, the challenge of digital business transformation featured strongly in the opening sessions. Richard Holmes, General Manager Infrastructure & Operations, of Westpac Banking Corporation gave the opening address. He spoke about Westpac’s efforts to keep thinking like a startup, despite being one of Australia’s oldest banks, in order to keep one step ahead of the competition. There were also presentations from Bill Alessi (Alpha Modus) and Matthias Rebellius (Siemens CEO). Both described their journey with IBM and Siemens announced they are partnering with IBM to improve the management of building sensor data to reduce operational costs. The session really drove home the IBM vision of innovation and that IBM can take you through from development to deployment in the Cloud. Announcements were also made regarding partnerships with VMWare, Apple and other acquisitions. 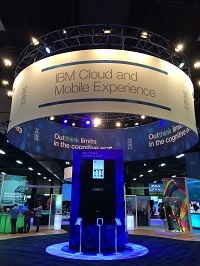 To put it into Vegas speak, IBM are “doubling down” and going “all in” for Cloud. There was also discussion around the Swift programming language which is to be used by Apple for the new generation of Apps. Apple have open sourced Swift and IBM were the first to adopt the language in their IBM Bluemix Cloud development platform. Don Barry, IBM Global Centre of Competency Lead/Advisor, gave an excellent presentation on leveraging data for optimal return on assets with Enterprise Asset Management. Don was very passionate about the fact that assets are acquired to produce value and should be used to drive value not simply be viewed as a cost. Pam Denny, IBM Designer/Architect Maximo BI, is another passionate individual who enjoys sharing her knowledge and how new product developments can relate to Maximo users. Through her session I was reminded that Cognos BI is included with Maximo 7.6 licenses and that the new Watson Cognitive Analytics can be used with any Maximo version data sets, or any data for that matter. Its interesting just how easy it is to perform Cognitive analysis on data exploring trends, data quality, interpreting natural language and assembling this into a dashboard without the use of any SQL. The other great thing is that you can setup a trial account and work with 100,000 rows of data and 50 columns for free. There are literally hundreds of exhibitors in the EXPO area, and I have managed nothing more than a cursory glance around as yet. Looking forward to exploring in detail over the coming days.